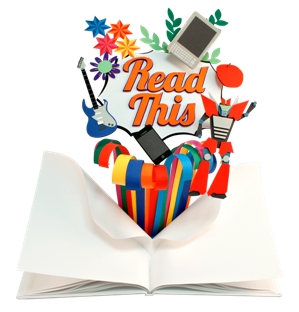 The National Year of Reading organisers are currently promoting the Read This! competition. Watch as the highly creative team at Madmen Entertainment craft the sculpture that features on promotional material for the competition. Read This! is a National Year of Reading competition for teens. It’s an expansion of something that already happens through the Centre for Youth Literature (http://www.insideadog.com.au/blog/inkys-creative-reading-prize-2011). in 2012 and then provide a convincing argument in the form of a creative response to the story. This will be a book review, but it could be in the form of words, pictures, film, song, or something even more avant garde. The 2012 Creative Reading Prize opens on 1 March 2012! Got a favourite book? Think everyone should read it? Well here’s your chance to convince them and you could also share in $40,000 worth of great prizes!